How should you choose the right tire for your track and your track conditions? I’ll also talk a little bit about tire compounds. Before I get into tire selection and the whole process I just wanted you to know that I have literally reached out to a few different all my friends that are top pros and I’ve asked them their opinion and at the end of the day this is really more of an art than a science. You’ll see that some pros like, for instance, on a short course you’ll notice that some pros like to run the same tires front and rear where some pros will try to run a much tamer tire up in the front of the car to just smooth it out. So at the end of the day there is a lot of art in this. There is science behind it, but there’s a lot of personal preference that goes on. So I’m just going to give you some basic rules of thumb and some guidelines and hopefully it’ll help you out in general. Probably the best way to find out the tire that seems to work the best is just to go look up the fastest guys at your track. Generally those guys have done their homework and they’ve done some testing and even if they don’t have the best possible tire usually it’s a pretty good starting point. So in general checking with your fastest guys is best but here we go. So a pro line tire is for low dust usually a damp track indoor. I have seen these used in different compounds outdoor like a hot rod that shoots out when it’s grooved up. Another one is a pro line suburb. This is for the same thing it’s for like an indoor, a little bit more dust, a little bit less wet, toward the dry side and then you have a holeshot. Now this is generally an outdoor tire although I have seen guys put these on the front of short course trucks to smooth out the steering. 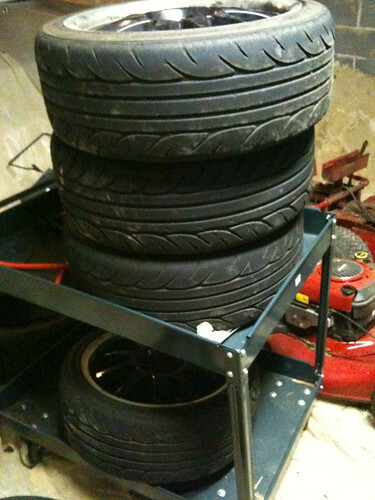 Other tires you’re generally going to be using in a clay compound especially indoors. The stunner is the type of tread pattern, which is one of my favorite types of tread patterns because it’s somewhere in between the holeshot and the blockade, but basically this is for very, very little dust. These tires can all be used in different conditions or for different driving styles or different set ups, different driver preference. I wouldn’t swap between holeshot or blockades. I actually asked a top driver a few questions before writing this article and he said basically he confirmed what I’m sharing with you now, but he did say that there are a lot of different conditions that you might want to change how the vehicle responds or sometimes you get tracks and have really big ruts in them and so a softer tire might catch ruts so you might actually run a harder tire even though they don’t have the best lap time just because it makes the car easier to drive more consistent. Like I said tons of personal preference going on right here, but those the general rules. I want to talk a little bit about tire compounds for minute. For the most part when you’re indoors you’re generally going to use clay tires, although, I have seen guys use M3 and M4 with good success depending on the track conditions as they change. Believe it or not on my own home track when we first put the track in everybody ran M4 and super soft tires inside, but as the track came around now we all run clay tires. So I’d love to tell you guys exactly what to do, but there are only guidelines, there are no hard and fast rules. So outside as a general rule when it’s up at 95 or 100 degrees you’re probably going to want to run on something like an M2. As it cools down a safe to say 75 to 85 degrees you’re at a M3 and then it cools down even below see 75 degrees and into the sixties you definitely want to be on something like an M4 as a general rule.